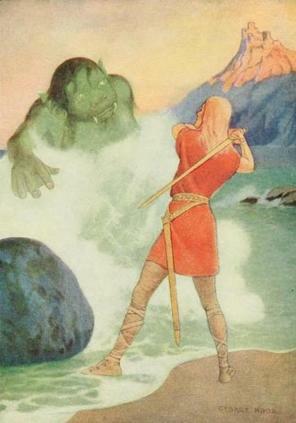 “Then Silverwhite drew upon his sword with a great sweep and rushed upon the sea-troll.” Illustration by George Hood from The Swedish Fairy Book by Clara Stroebe, published 1921. Read Swedish fairy tales by authors like Clara Stroebe and Andrew Lang. Jump to full list of Swedish fairy tales. About: As Protestantism spread through Sweden beginning in the mid-1500s, children’s stories and folklore took on a new flavor. While fairy tales with stories of trolls and giants were ever popular, they also contained good, Christian values that encouraged morality and virtue. Mythology slowly faded away, but some remnants remained. Trolls were still free to roam the realm of folklore, but now, for example, they were afraid of church bells and could not harm anyone who carried a cross, even if the cross was fashioned out of a loaf of bread. Swedish fairy tales have been said to be straightforward and sincere. They are a blend of curiosities, like a Herculean boy born from an egg, or a fisherman’s daughter outwitting a sea monster, with good, old-fashioned manners. The greedy and gluttonous never win, but those of good heart, quick wit and honesty live happily ever after. Giants assist the lowly and poor, and farm girls become princesses. Similarities between the Swedish fairy tale, The Lame Dog, and the Greek myth, Cupid and Psyche, reveal origins in classical literature, but most tales are uniquely Scandinavian and of Nordic descent. The author Klara Stroebe (also known as Clara Stroebe) edited several fairy tale books, and her collection of Swedish fairy tales is known as The Swedish Fairy Tale Book.